Actual size of book - H 9" x W 6"
Since the 1700's, Americans have used tokens and medals to encourage business, lampoon politicians, celebrate special events, pay fares, promote social causes, award the deserving, and scold the wicked. 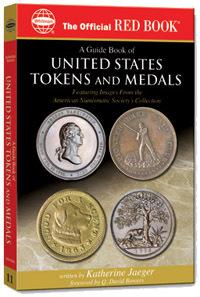 In the Guide Book of United States Tokens and Medals, award-winning author Katherine Jaeger explores these fascinating and collectible pieces of American history, from colonial times to today. The book features thousands of full-color illustrations, market values, and a grading guide add to the book's reference value. This book is essential reading for every coin collector and American history buff!